Exhibition ‘Forest Re-Cycled – The Journey of Wood’ is a loosely conceived sequel of exhibition ‘Forest Re-Cycled – Stories of Forest Worlds’. It is located in the Prague building of the National Museum of Agriculture. Play, experience, and stories of the journey of wood all germinate in the new exposition ‘Forest Re-Cycled’. 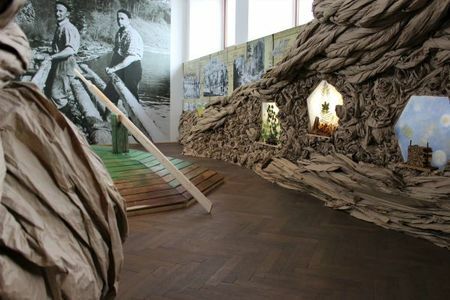 Listen to the ancient song of a river that carries streams of timber rafts, become loggers who grasp an oar firmly in their hands, and follow your guides on the mysterious journey of wood in the National Museum of Agriculture in Prague! Wood was, is, and will be a material of great importance in our lives. Wood must undertake a long journey before it becomes timber, ready for use. In the forest, trees, still full of sap, are felled by rugged men. Then they are taken by their helpers to train tracks or a river, where they pass on to men who float it, strong, merry men who tie the logs into large rafts and with a song float the dead giants of our forests to all parts of our country for industrial processing. In towns, the wood is for the first time touched by machines, and logs, which used to resist human hands, are overpowered by machinery. Various machines bite into their smooth bodies to create from their timber a multitude of things for our life. The cleared place in the forest is planted with new trees, and when they grow large, they, too, will meet the same fate as their predecessors. They, too, will serve people, be it by producing heat, or by being turned into objects of daily use.